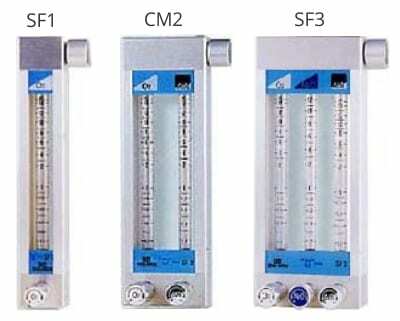 Flowmeters are devices for the supply of medical gases, consisting of antistatic graduated measure tubes and dosage units in an anodized aluminum body. The inlet connection at the bottom is designed to be connected to existing circuits of gases at a central input or to cylinders with pressure regulators. The outlet can be connected to an anesthesia vaporizer or the gas can be supplied directly through the gas feeding unit. 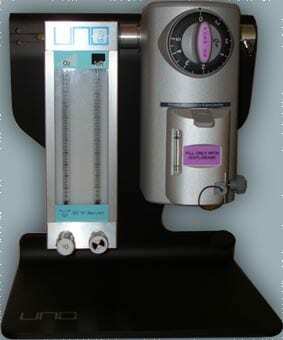 The RM/145-2 flowmeters are used for the supply of medical gases using two meters, particularly suitable for respiratory therapy. The measure cones and inlet connections on the PMMA body are designed to be connected to gas circuits, centralized feeding or directly to the cylinders with pressure regulators. A vaporizer can be connected to the outlet of the dosage unit, or the gas mixture can be supplied directly from the gas feeding unit. The FM2200, FM2300, FM2500 and FM2800 consist of two antistatic and graduated measure tubes with a dosage unit in an anodized aluminum body. The inlet connections for O2 and N2O are designed to be connected to the centralized gas input or directly to cylinders with pressure regulators. The unit contains a valve that automatically blocks the N2O supply when the feeding pressure of O2 drops below approximately 0.8 bar. An O2 and N2O mixture can be supplied through a dosage unit, and an incorporated mixing device portions the N2O to ensure a minimum of 30% O2 in the gas mixture. The outlet can be connected to an anesthesia vaporizer or the gas can be supplied directly. The O2+ button allows a rapid supply of O2 directly at the outlet of the mixture on the gas feeding unit. Hypoxyguard System At least 30% -3% O2 is guaranteed in the mixture with N2O opening value equal to 0.4L/min (with inlet pressure of 3.5bar). 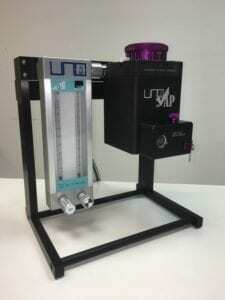 The vaporizer and flowmeter are supplied already mounted when ordered with a stand.